Internal differences make similar-looking golf balls perform in varying ways. All golf balls look pretty much alike. But what's inside the ball can affect the height and distance of shots and even how the ball will spin when it lands. So before you tee it up, find out more about the ball and how it can affect your game. Golf balls vary greatly in quality and price, so before deciding on a particular make and model, know how much you can afford to spend and how quickly you go through a dozen golf balls. If you're still learning or you lose a ball every couple of holes, you'll want to stay away from the top-of-the-line balls, and, perhaps, consider used (or reclaimed) balls, which generally are cheaper than new balls. Is it a distance ball? A two-piece golf ball -- a ball with a solid inner core and a hard cover -- is designed to produce maximum distance. Typically, the hard cover is made of Surlyn. This type of ball is especially helpful for beginners or short hitters who need extra length on their shots. Because beginners tend to cut balls with poor shots or knock balls into trees and cart paths, the hard covers help those two-piece balls last longer. A high-performance ball is the most expensive ball on the market. It is made of multi-layer construction (three or four pieces) and uses a softer cover material, which allows for greater control, particularly around the green, and spin. Because of the softer cover materials, these types of balls are also the least durable. As a result, these balls are better fits for more experienced or expert players. Golf ball compression, which refers to the hardness and tightness of the core, is measured in numbers. The lowest compression commonly available is usually 80 (although lower compression balls are available). This compression level offers more distance but less control. A 100-compression (and higher) ball gives experienced golfers greater control. Inexperienced golfers and those who do not have a fast, solid swing, are unlikely to get any benefits from a higher compression ball. Most average golfers use a ball with a compression of 90. A softer cover, especially one made of balata or urethane, can give the ball extra spin, especially on shots for which you want a ball that will stop and back up on the green rather than roll forward off the green. Look for multi-layer construction with a softer cover if you're looking for more spin on your shots. Before you tee up the first ball you find in your bag, take a moment to see if it has been scuffed or cut. The slightest deviation can adversely affect how the ball flies and how it lands. 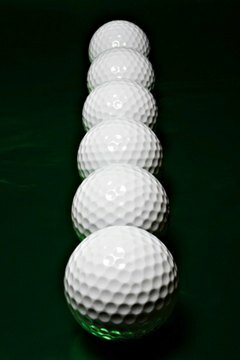 If it's a casual round with a buddy and you don't want to risk an expensive ball around a lake or stream, maybe the two of you can agree to try a sacrificial ball on those shots. The more you play a particular type of ball, the better you'll know whether it's the right one for your game. If you try a different type every time out, you'll never know what ball will help you reach your potential, so give each ball type at least a few rounds to see if you two are a good match. What Is the Difference Between Golf Balls?